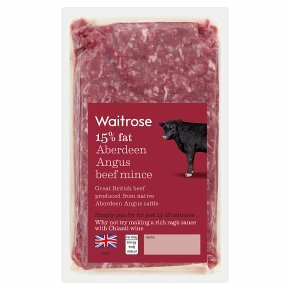 Aberdeen Angus Beef Mince (typically 15% fat). Pan Fry. Time: 24-26 mins. Remove all packaging. Place the mince in a frying pan and cook for 4-6 minutes until browned. Add choice of sauce or stock, bring to the boil, reduce heat and simmer gently for the remaining time, stirring occasionally, until thoroughly cooked. We recommend that all minced beef should be cooked thoroughly until the juice runs clear and there is no pink meat.